The members of R-Group are faced with a crippling “Ghost Code” implemented by cyber pirates Mephisto and Callisto. A ghost code that evades detection and creates chaos and havoc everywhere it goes. Petra, Jacob, and Quip must find a way around the code and destroy it before the world suffers a financial collapse. The two evil cyber terrorists have more than just financial collapse on their mind – they want to break technology! The R-Group finds one of their own as a victim – Juan – when his plane displays the ghost code; he loses all control waiting for the plane to break apart from its acceleration. A heart-tugging moment is shared before Juan is just gone. The team works together to thwart the evildoers and find the crash site of Juan. Charles Breakfield and Roxanne Burkey have upped their game. This book not only kept the listener on the edge of their chair but it tugged at their hearts as well. R-Group are the superheroes without the capes and because Breakfield/Burkey have developed the characters solidly, one cannot help but feel the pain and joy of the characters. I loved the teaser Breakfield and Burkey had at the end, you know the next book is going to be just as wildly intense filled with chaos and more evildoers! At what point do we stop trying to further technology? 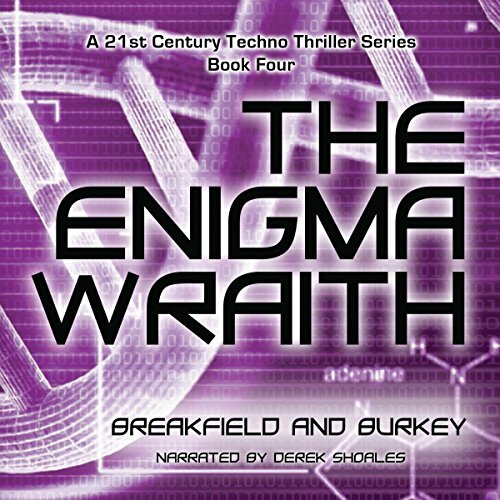 Derek Shoales, the narrator for the Enigma series is excellent. He has distinct voices for each character and moves the story further through his energy. He has become the Enigma series to me. He’s perfect. His voice is soothing yet exudes appropriate emotions. I enjoyed this one! The continuity of the story line - reviving characters from the 1st and 2nd volumes - adding to their persona's... The story was riveting.... Breakfield and Burkey continue to grow the franchise - and I'm loving it!! A Series well done!! order to protect the world’s technology infrastructure. They are great characters! I really like them. It’s a fast paced technological thriller that sucked me in from the start and kept me on the edge of my seat until it ended. In fact I got stuck in traffic listening to this book and was glad that I did because I had an excuse to listen for longer. It is the fourth book in the series but if you are new to it, it’s got enough detail that you can easily follow the plot without any confusion. You should check out the earlier books because they are great but you don’t have to. But they are great. There is a sense of realism to this series and this book that is great. Not too heavy in terms of the tech element of the stories. For me they hit that just right. I always think this with these books but will say it again. I can imagine something like the Ghost Code really happening and how truly awful it could be. Which is a level of empathy that gives these books a great edge. The narrator does an excellent job of adding to the sense of tension and pace that make this book really great. Also really draws out the characters identities. By far I think this one has to be my favorite one so far out of the series. I mean hacking a car driverless car. And not to mention more of Jacob in this one. I really like his character. I got nervous because this one seemed the hardest for the tram to track down and take down. Although nothing is truly taken down I believe because somehow someway they are all connected. Again as always looking forward to the next book in the series.